The Funky Felter: Bye bye...at least for a little while - the Etsy forum that is! Bye bye...at least for a little while - the Etsy forum that is! Well, it has been a few days since I last posted. For one thing, my home internet service has been a little crazy with intermittent service until yesterday. I had to trade in my cable modem box, and my very skilled, mechanically minded husband had to do some minor things to get our internet access back to tip top shape. I had an appointment with the cable guy today, but luckily, it did not go that far, and I didn't have to wait all day for the cable technician to come fix it. Yay! Anyway, now that the internet service is back to normal, on to other things . . . Some of you may know that I spend a lot of time (more than I really should) in the Etsy forum. It is a wealth of information there and, usually, there's great support from the community of artists and crafters. If I ever have a burning question, I go there to ask and get an immediate response, and normally, a very well educated response. Of late though, I've noticed that there's been a lot of negative posts and comments as well as antagonistic behavior among sellers in the Etsy forum. (You can read more about my thoughts on it in this post.) Maybe it has always been present, and I just never noticed it before, but whatever the reason, it has come to really bother me in the last couple of weeks. I find myself leaving the Etsy forum more frustrated and upset than when I got there. I always liked posting and feeling helpful to my fellow artists and crafters, but now I feel like it drains me of my creative energy. I just want to make it clear though that this is my personal experience, and for others it might not be true at all. Perhaps it is just a time in life for me right now where I'm more sensitive than another time. Ultimately, I've decided to take a little break from the forum. I will miss it though as I've gotten so use to posting there. It is almost like my way to have some social contact with others. After all, there's only so much that I can chat about with the bunny and the dog during the day. I am going to do my best to steer clear of the forum though for a little while at least and see how things go. Create, create, create for my shop and the upcoming No Coast Craft-o-Rama show. Promote online and off - this I do already, but I can always do more! Finish my press kit (which I've been working on now for a couple of months and just can't seem to finish!). Oh, and I'll probably write up a nice little article on press kits eventually so be on the lookout. and . . . I'm sure there are other things too that will come up. There always are! My Dear John letter to Etsy's forum . 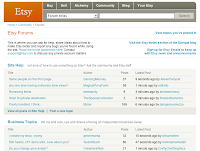 . .
Well, good bye for now Etsy forum. I know that I will return to you, and hopefully by then, either you or I will have a better attitude and outlook on life. Like I said, maybe it is just me . . . Isn't that what you expect to hear in a break up? Okay, so I'll be back to you some day. We both know it! I cannot resist your charm. The image is a screen shot of you, Etsy forum - a little something for me to remember you by during our time apart. I'm trying not to cry, but alas my eyes are welling up as I type. Farewell for now. Until we meet again some day . . . I absolutely know what you mean. It has been getting progressively worse the last 6 months. I don't know where all of the negative energy is coming from. I've been spending a lot less time there myself, expecially on the weekends. I hope you enjoy your break and gets lots done! You put this very well. I'm spending less time in the forums too. Gives me more time for creating. In a way I'm glad to hear that I am not the only one that has noticed such a change in the Etsy Forums that they have decided to stay away... on the other hand I'm very dissappointed. Alas, Etsy isn't the only forum going like that route! Maybe money getting tighter brings out the worst in some folk?! I think I'm going to stick to blogging and checking up on my favourite sunshine people, like your good self... taking a break from the workload will be much better that way! Shalana, it's not just you. I've been spending less and less time on the Etsy board too. I can't stand all the negativity and BS there anymore either. I know what you mean and I've only spent a few hours a week there. I am re-focusing my energy too.